Partnering with a global icon, ~$10M. 1 vinyl banner, $50. Bad press, priceless. 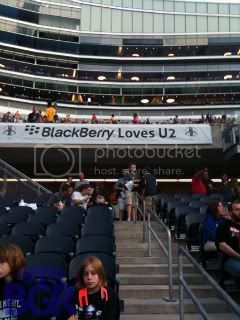 I'll admit it, we were pretty excited to see what Blackberry and U2 would cook up when the two brands announced their partnership last April. At the time, we said the partnership was "clearly not about awareness - both the brand and the band already have leading global mindshare." Judging by some recent reports, we may be way off here because banners and concession stand videos sound a lot like an awareness play. If you're following up Steve Jobs' U2 Ipod and everyone knows that Bono's dumped $165 million into a Palm investment, you've got to come with a lot more than that and some TV spots. Such is the thesis over at the Boy Genius Report, a mobile technology trade blog that calls out Blackberry for what they say is pretty lame attempt at halo affinity. After attending the Chicago show, they report "instead of using this opportunity to push their brand forward, it almost seems like just a second thought to throw some quick marketing dollars to try act like your company is doing something in the consumer and “cool” department." He also reports that the only demo'ing that he saw was other fans playing with their iPods. Not a good sign. To be fair, banners were probably a small throw in benefit to the overall deal. Nevertheless, for a brand that benefits from the perception of technology innovation, banners are probably not the best way to communicate that message. In this case, it may be that the medium matters more than the message. Go check the full story out for yourself and weigh in!